Champlain and Hélène Boullé return to Paris. She does not journey to New France again. Henri II, Duc de Montmorency, sells office of viceroy of New France to his nephew, Henri de Lévis, Duc de Ventadour. France and England go to war. The Comapagnie de Caën re-forms under new viceroy, Ventadour. Cardinal Richelieu replaces Ventadour as viceroy of New France. Cardinal Richelieu forms Company of the Hundred Associates, which is granted fur trade monopoly in New France. 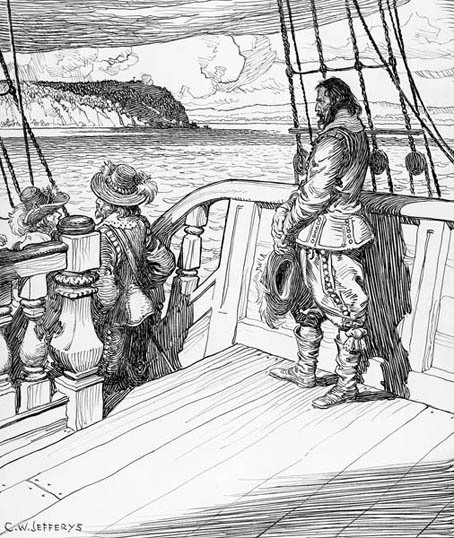 Mercenaries led by the Kirke family, under commission from King Charles I of England, begin to commandeer French ships on the St. Lawrence. The Kirke brothers seize control of New France and capture Quebec. Champlain returns to Paris by way of London and continues struggle for return of New France to the French.